Three brilliant breweries all rolled into one beer: I can’t wait to try this. I bought it from my local craft beer store – Grunting Growler. The can was chilled, and I arrived back in after a busy evening – it was time to sample. 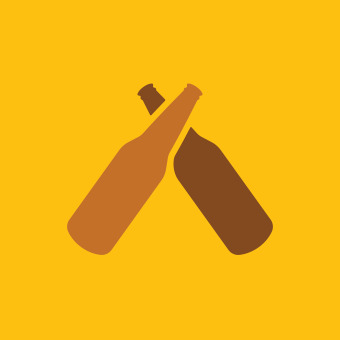 The beer was simple in design: a bright yellow background, with clear, bold, blue text. It poured a slightly hazy honey-colour and smelled absolutely sensational! There were a surprising number of tropical aromas produced from the beer given that it had little-to-no foam top. On sampling, it tasted as wonderful as the aromas had promised, but also gave so much more. Rich tropical sweet notes flooded the palate initially: it was so intense that it felt as though it should be worth at least one of your five-a-day! These tropical flavours slowly melded into a boozy, but not overwhelming, bitter finish. Stunning. Diagnosis: 4.5/5. “LDS MCR NCL” resulted in me ‘Googling’ a 12-pack… if these arrive soon, I will probably not post an update now for a couple of weeks as I enjoy these!